K9 Friends Annual Puppy Ball is Back Again! Move One is proud to sponsor this year’s K9 Friends Annual Puppy Ball! The evening will be full of fun and excitement. There will be music and dancing, awesome auctions, terrific tombola and a prize draw. Don’t miss out on what promises to be a great evening with a touch of the feel-good thrown in for added measure! Kicking off at 7:30pm the Annual Puppy Ball will take place at Raffles, Dubai. The dress code is black tie or national dress and the invitation includes welcome drinks, a door prize, 4-course dinner and half a bottle of beverage. Show your support for this worthy cause and buy your tickets now. To make a booking please call +971 4 885 8031, +971 50 274 1949 or email k9@emirates.net.ae. If you would like a vegetarian meal don’t forget to mention this at the time of booking. 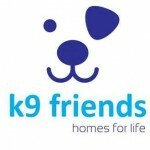 For further information visit www.k9friends.com. Click here to check out the photos taken at the 2011 Puppy Ball.